The homelessness charity has made a video featuring its own version of the festive tune The Twelve Days of Christmas, sung by some of the homeless vendors who sell its magazine. 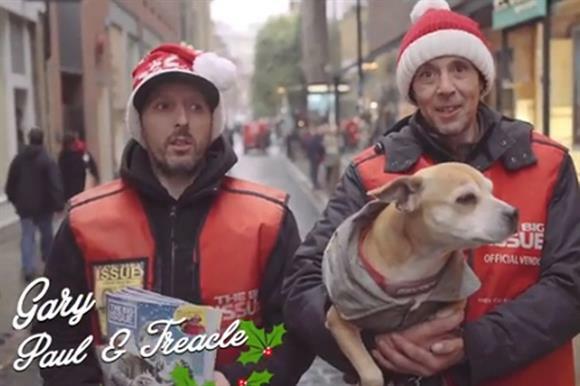 In each verse, vendors sing about what the Big Issue Foundation has "given to them": for example, the ability to take their dog to the vets, to get a bank account and – importantly – to buy a turkey sandwich. The fil also features John Bird, the founder of The Big Issue magazine, Stephen Robertson, chief executive of the of Big Issue Foundation, and the actor Christopher Timothy, who is a supporter of the charity. It is shot in a light-hearted style with the vendors getting their lines wrong and making jokes while filming. The video ends with a plea to donate to the charity, and a text code that viewers can use to give £10 a time. In addition to the song, the Warwickshire band The Big Secret Sound have recorded a Christmas track, I Love You Like Christmas, to raise awareness of homelessness. The proceeds from this will go to the Big Issue Foundation. This has sparked the social media hashtag #makearoof: anyone who wants to contribute posts a picture of themselves on Twitter making a "roof" gesture by raising their arms above their head. The singer-songwriter Glenn Hodge has also recorded a song that he hopes will raise awareness of the charity. The charity hopes this video will raise awareness of the positive impact of its work. Robertson said he was "delighted to have such an upbeat Christmas message to send out to our supporters, highlighting the energy and positivity of our sellers on the streets". The charity is also keen to encourage people to make one-off or monthly donations. There are links allowing viewers to do this next to the video on the charity’s website. The charity is also sending a festive e-card that has the film embedded in it to its donors and supporters to thank them for their help. How many people have watched it so far? The video, which was created by the advertising agency fold7, had been viewed 1,350 times on YouTube after being online for six days. The video combines a fun, festive campaign with a more serious message about the impact the Big Issue Foundation has on the lives of homeless people. The fact that the vendors are cheerful shines a positive light on the charity's work, showing potential donors the effect that their money will have without the need to tug on their heartstrings with an emotional plea about homelessness at Christmas.